Members of the Harvey Mudd Engineering Clinic team for Niagara Bottling: Robert Cyprus, Carmel Zhao, Alexa Le, Professor Kash Gokli and Faith Lemire-Baeten, plus Wallace Brithinee, an MCIE judge. Team members not shown: Shaan Gareeb and Jose Orozco. 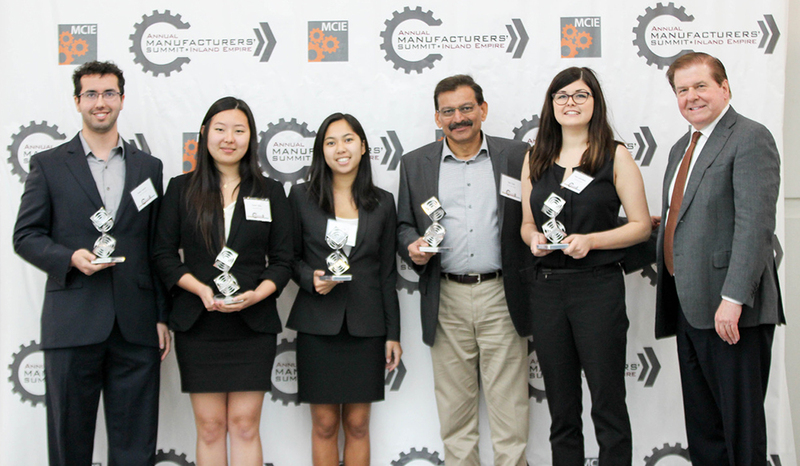 During the 2016 Manufacturers’ Council of the Inland Empire award ceremony celebrating the most innovative businesses and leaders in the Inland Empire, participants of Harvey Mudd College’s 2015-2016 Engineering Clinic Program received an E=mc² Innovation Award for their ingenuity in solving a changeover problem for Niagara Bottling, LLC. Their project, which ran from September 2015 to May 2016, resulted in a projected 70 percent total savings for the changeover time, amounting to $1.3 million savings annually for Niagara Bottling, the largest private label bottled water supplier in the United States. The student team of Spenser Anderson ‘16, Tito Barina ‘17, Aaron Rosen ‘16, Faith Lemire-Baeten ‘17, Alexa Le ‘17, Shaan Gareeb ‘17, Carmel Zhao ‘17, Jose Orozco ’17 and Robert Cyprus ’17 worked alongside Niagara Bottling liaisons Craig Young, Kartik Gurav, Colin Cavanaugh, Daryl Anderson and Michael White, and Harvey Mudd Clinic advisor Kash Gokli (professor of manufacturing practice), to develop mechanical, electrical and operational solutions that reduced the changeover time for Niagara’s Krones packing machines by at least 50 percent. The team used an $8,800 budget in order to develop prototypes and operational changes covering four areas of the packer. The team performed time trials and operator interviews in order to gauge problem areas related to the modification or recalibration needed on machines selected to produce new items (changeover). The five areas in most need of improvement were the nesting bars, film puller, infeed rail, nesting guide rail and the operation procedure. Team members met with machine operators, inspected equipment then sought to determine solutions. In addition to developing prototypes and tools, the student team suggested changes to operational procedures that involved single-minute exchange of dies and lean manufacturing tool (5S) techniques, reducing overall changeover time by about 30 percent. After completion of the project, the team presented prototypes to Niagara’s vice president of manufacturing and Krones’ Engineering Design Team. Many of these improvements were handed off to Krones, which is working with Niagara to implement these changes on a large scale. The Harvey Mudd Clinic team’s operations report was distributed to all Niagara plants in order to standardize their changeover process. In addition to the significant time and cost savings on Niagara’s packer changeover process, both the machine and operational changes improve operator safety while maintaining machine changeover accuracy. The Clinic Program, a program of collaboration between industry and Harvey Mudd College that has been a hallmark of this institution for more than 50 years, engages juniors and seniors in the solution of real-world, technical problems for industrial clients. Founded as an innovation in engineering education in 1963, the Clinic Program has been expanded to other Harvey Mudd academic departments and copied by institutions worldwide. Since its inception, over 1,500 projects have been completed for more than 450 corporate, national laboratory and agency sponsors. Companies retain all intellectual property rights that arise out of the project, and it is not uncommon for Harvey Mudd students to be named on patents. In recent years, Clinic sponsors have averaged between 10 and 15 patent disclosures at the end of their projects. Posted in: Award, Clinic, Diversity, Engineering, Entrepreneurship, Experiential Learning, Students.